Details of an upcoming Olympus digital SLR camera have been released by an online retailer. 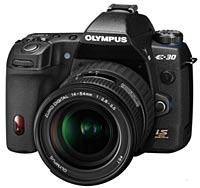 Although the manufacturer’s yet to make a formal announcement about the camera, online photography retailer Adorama said Olympus has “announced” that the mid-range shooter will be called the E30 and sport a 12.3-megapixel sensor. Adorama added - its page has now been removed - that the E30 will use the Four Thirds lens interchange system, just like the E3, launched back in November 2007 and which the E30 looks set to supersede. The E30 will also feature an 11-point autofocus system, a feature already present in the 10.1-megapixel E3. Image stabilisation and face recognition will be present too, although this is hardly a surprise. There’s also mention of a live view shooting mode and 5f/s burst snapping option. Adorama said the Olympus E30 will be launched in January and cost around $1300 (£820/€1000). Olympus wasn’t available for comment.